Writing is hard. Getting a book published can take years of perseverance. Nuggets of positive feedback always help a writer keep going and I’m no different. Recently, I’ve had some fantastic comments on the first eight chapters of THE KINSHIP from other Authonomy users and I’m so very grateful. I can only hope I find an editor and/or agent soon who feels the same way about my story as these people do. I hope they don’t mind me noting their comments here. Kinship spy JANA RANDALL is yearning for a mission to redeem herself and her career after the suspicious death of her partner. When sheâ€™s captured on a black ops mission to distant Ico, Jana is forced to share her mind with the memories of a long-dead queen and redemption seems beyond her grasp. Once escaped, Jana finds herself thrown between a far-reaching conspiracy to reclaim a lost golden age and a bid to control a narcotic that could enslave or liberate the Iconnu. Randall must team up with religious leader BRANNON BAYNE to seize command of a particulate matter shield before the planetâ€™s periodic variable star flares. A dynastic invading group, a drugs and arms cartel, and a secret cabal all struggle with the Iconnu to control the bloodstar plant, whose super anti-oxidant properties affect all life on Ico at the molecular level and whose life-cycle is tied closely to the solar flare. 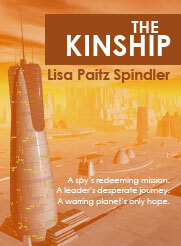 THE KINSHIP tells the story of a spyâ€™s redeeming mission, a revered leaderâ€™s desperate journey, and a warring planetâ€™s only hope. “This is superior sci-fi. Well crafted, deeply imagined, beautifully told. A polished piece. Damn right, you’ve gotten such amazing comments. This story – and your writing – ROCKS! Sometimes the ones that fight the hardest and longest eventually reap the biggest reward. Getting published will happen to you…hopefully sooner rather than later! Count me in as a fan as well. I cannot for the life of me understand why this book has not been published. Fingers crossed for you!